New shows for the kids to explore on Netflix January 2016 #streamteam | DaDa Rocks! Its been a big month for Netflix in the Kids department it started with their original series of DRAGONS: RACE TO THE EDGE: SEASON 2 which for any Dragons fans has been a big hit. 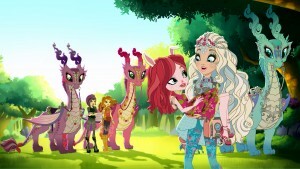 Now they’re starting EVER AFTER HIGH: DRAGON GAMES, which I think will be a big hit with preteen girls. Adding to ANGRY BIRDS TOONS Season 2, ICE AGE: THE MELTDOWN, SOFIA THE FIRST: SEASON 2. It would almost like just another month till you think about the amazing new episodes of Croods. Dawn of the Croods is a great adventure for those that loved the movie… the series is a nice to keep moving the story forward. You can watch all of their pre-hysterical adventures now on Netflix. NextSesame Street Live “Let’s Dance” at MSG coupon code for BOGO! 10 Days of Gifting! Nickelodeon DVD Prize Pack!